Art: Children will create wet felted sheep finger puppets to use in drama sessions. 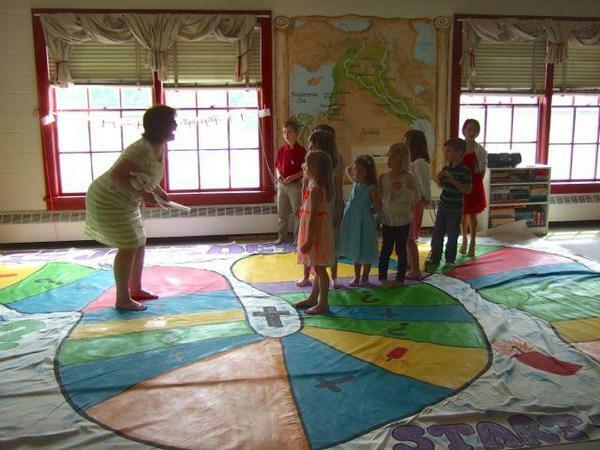 Games/Bible Skills: Children will play a life-sized board game to review the story. 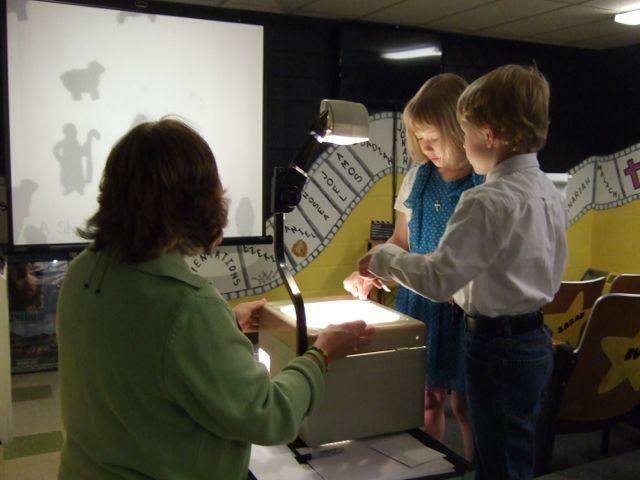 Movie: Children will watch several video clips that tell the story, then retell the story using an overhead projector. Computers: Children will explore the story through the perspectives of the different characters using Kid's Pix. God looks for all who are lost. God rejoices and wants us to celebrate when the lost are found. “Rejoice with me. I have found my lost sheep.” Luke 15:6b. Children will discuss the concept of God’s prevenient grace (grades 3-5). Children will identify God/Jesus as Shepherd and we as sheep. Children will explain what a parable is and discuss how Jesus taught using parables. Children will memorize Luke 15:6b. “Books of the Old Testament,” Books of the Bible, Custom CD, Troy and Genie Nilsson. “Books of the New Testament,” Books of the Bible, Custom CD, Troy and Genie Nilsson. “Leaving 99.” Audio Adrenaline, Worldwide, Forefront Records, 2003. “One Thing Remains,” Passion: One Thing Remains, Kristian Stanfill, Sparrow Records, 2012. “Your Love, Oh Lord,” Third Day, Offerings, Essential Records, Brentwood Music, Inc., 2000. “His Love Will Go On,” RPM Volume 4, One Way Street, 1999. “The Steadfast Love of the Lord Never Ceases,” Acoustic Worship, Brentwood Music, 1998. “I am the Good Shepherd,” Verse 2 Verse, Top Kidz Scripture Songs featuring Larnelle Harris, Wonder Workshop, Inc., 2003. “Put a Little Love in Your Heart,” Hallelujah Hop, Brentwood Kids Company, 1994. Stories have tremendous power; they teach, evoke emotions and inspire thought.Stories grab the attention and kindle the imagination of the listener.The Jewish tradition was rich in stories and Jesus was a master storyteller. Jesus taught often using special stories called parables. In fact, over one third of Jesus’ teaching in the gospels is recorded in over thirty parables. There are three divisions of parables: those that were told early in Jesus’ ministry that addressed the Kingdom of God, the later parables that told of God’s infinite mercy to those who repent and Jesus’ last parables, told shortly before his death which spoke of the reward of the righteous and eternal life. Parables helped Jesus’ audience (and us, today) understand the world in which Jesus lived, the mind and spirit of Jesus and provided valuable lessons for living in the Kingdom of God. Jesus told parables to answer questions or to explain issues. A parable uses everyday images to illustrate something about God or God’s kingdom or a particular spiritual truth. Parables are sometimes referred to as “earthly stories with heavenly meanings.” Jesus used everyday objects and common situations in the parables he told. The use of the common or well-known image helped the listeners understand the less well-known concept. The images that were familiar to first century Palestine might not be as familiar to us today. What images might Jesus use today to convey the same truths? The word parable comes from a Greek word that “means, literally, ‘that which is tossed alongside.’ This implies a comparison, analogy, elaboration, or illustration. Parables invite the audience to come alongside and be part of the story. They invite audience participation. Parables do not tell you what to think, they require the listener to reflect and examine the story and its meaning. Parables allow the hearers to understand the message on different levels to accommodate their different abilities and willingness to accept the message. Jesus often said that the unwilling and those without faith would not understand the deeper meanings of the parables he told. To these people, a parable was simply a story. But for those who listened with willing, open hearts and faith, the message could be life transforming! This is true for us today as well! Many of Jesus’ parables were told as a result of confrontation with the Pharisees. The Pharisees regularly criticized Jesus for his association with tax collectors and other “sinners.” According to the Pharisees, respectable religious people didn’t associate with people who disobeyed God’s laws. Jesus often attacked this legalism – accusing the Pharisees of caring more for their rules and “outward show” than truly loving people and helping them. The Parable of the Lost Sheep is the first in a series of three parables about the Lost: the lost sheep, the lost coin and the lost son (or Prodigal Son). Jesus (as he so often did), used these parables to make a point to the critical Pharisees. Pharisees were self-righteous religious leaders who believed the expected Messiah would arrive and establish a powerful and glorious kingdom in which they would have ruling positions. It was beyond their radar screen to see the Messiah as a heavenly Shepherd, rather than an earthly King. The Pharisees publicly criticized Jesus for eating with tax collectors and sinners. Tax collectors were despised because they were fellow Jews hired by the Romans to collect Romans taxes. Most tax collectors cheated by collecting more than was owed and pocketing the difference. “Sinners” were the obvious criminals and prostitutes, but also those who did not live up to the Pharisees’ meticulous and multiple regulations of religious living. For most working men, it was impossible to keep all of the rules and regulations set by the Pharisees, therefore many were considered ceremonially unclean and shunned by the religious leaders. Pharisees placed little value on the lives of these so-called sinners believing that their behavior made them beyond saving. Jesus told the three parables of the lost to confront their hypocritical and self-righteous attitudes. By demonstrating his care and concern for the lost, Jesus showed the Pharisees what their attitude should be. This should be our attitude as well. Jesus clearly was not thinking of himself. If he had been thinking of his own comfort, he would no doubt have spent his time with angels and holy and faithful people. But Jesus’ heart was set upon the lost, and therefore he sought them out. Jesus spent his life pursuing lost souls. Jesus clearly knew his purpose was to “seek and save the lost.” (Luke 19:10) Jesus believed that God’s message of saving grace and love was for all who believe – not just for those who followed the rules of the Pharisees. He believed that spending time with the “lost” was a way to show them God’s love and bring them God’s message of salvation. The Pharisees, of course, would never do such a thing. They lacked tenderness and compassion. They were concerned with self, alone. They might have been religious, but they were not godly. To be godly means to be willing to give of oneself to others as Christ did. How does the Shepherd respond to the lost sheep once it is found? Does he chastise it or punish it for its waywardness? No! Rather we see a picture of loving care, compassion and mercy. The shepherd gently lifts the sheep onto his shoulders and carries it back to the fold. What a wonderful picture of God’s great and tender mercy for us when we, like sheep have gone astray. Grace is the gift of God’s mercy and love. There is nothing we can do to earn this. It is a gift, freely given. All we need to do is accept it. The Pharisees missed the main point here. They believed they could earn their way to heaven by their good works and their attention to “religious rules.” Unfortunately, their actions simply led to the development of self-righteous attitudes that placed them deeper in sin. From this perspective we see that the Pharisees were just as “lost” as those they criticized! The only difference between the Pharisees and the “lost” is that the “lost” knew they needed a Savior! John Wesley described God’s saving grace in three forms: prevenient, justifying and sanctifying. Prevenient grace is God’s grace given to us even before we understand about God. This is God actively pursuing us and wooing us throughout our life. God is calling us to Him. Justifying grace is that moment when we accept Jesus as our Savior and receive God’s promised gift of eternal life. We are made right with God because of Jesus’ actions on the cross on our part. Sanctifying grace is the work of the Holy Spirit within us as we grow more and more like Christ. Shepherds and sheep were common images in Jesus’ time. Sheep are affectionate, non-aggressive, not very intelligent animals in need of constant supervision and care. Scripture commonly uses the shepherd metaphor to refer to God/Jesus and the sheep metaphor to us. We are lost when we are separated from God. This can be the result of rebellion, or simply from inattention. What are ways we get lost? Do we just simply not pay attention and wander away? Do we take our eyes off the Shepherd for just a moment or two, only to find we have lost our way? Or do we intentionally or sub-consciously sneak away? How does it feel to be lost? Is it scary or lonely? Do we sometimes want to get lost? What are the advantages of being lost? Can we ever really get lost from God? How does it feel to know that no matter how far away we wander, God will come after us? People are precious to God! God seeks out all who are lost. Saving even one is cause for rejoicing! No matter how far we may wander, God never stops looking for us and wanting us to return home! God calls us to celebrate with him when the lost are found. Seeking the lost may mean that we have to go into the wilderness at times. Seeking the lost may mean we have to put up with those who “murmur” against us. God doesn’t give up on anyone, so we shouldn’t either. Have you ever lost anything? How did that feel? What did you do? I wonder how the shepherd felt when he realized one sheep was missing…. I wonder why the sheep got lost…. Why might Jesus have taught using parables? When is a time you have felt especially lost or separated from God? What happened? Did the Shepherd punish the sheep when he found it? What images might Jesus use today to convey the same truths? The children will create wet-felted finger puppet sheep to be used in their drama session. In the Art workshop the Bible story is explored through creative and hands-on experiences. The children may make something that they can take home to help remind them of the monthly theme or they may work together to make something for classroom or church to display. Gather necessary supplies – see lesson materials list. Review the Music CD. Plan to play the music as the children arrive, work on their art projects and during journal time. Write the memory verse on the white board. As children arrive, review the verse with them. After reviewing several times, erase one or two words at a time and have the children recite the verse. Repeat until they can recite the verse with no words on the board. Don’t forget the scipture reference! Welcome the children as they arrive. Please wear a nametag and help the shepherds distribute nametags to the children. Begin each class with introductions. Dear Lord, We are all like sheep, in need of Your guidance and love. Help us to understand the parables you used to teach us and feel the love that you have for us today and always. Amen. Each workshop includes the Bible story. One of our primary goals is to improve the children’s Bible literacy!If children did not bring their Bibles from home, use the classroom Bibles. Shepherds should help the children locate the stories. Use the Background Information to help you introduce the story. Remember that as the rotation progresses; the children will become more familiar with the story. When this happens, allow the children to tell you what they know. The children should still locate the story in their Bibles every week. Use the bold headings in their Bibles to guide your discussion. You may want to review some of the Bible notes as well. Be sure to fill in any missing information and add additional details using the Background Information to help you. One of the greatest advantages of this model is that children who come regularly learn the story in great depth. Each lesson contains more Background Information and discussion questions than can be used in one session. Remember, children are studying this story for four weeks! Be sure to follow the time guidelines and leave ample time for the activity. Once Jesus was talking to a group of people. Some were important leaders from the temple. Others were tax collectors who had cheated people out of their money. Now the people who thought themselves to be very good people weren’t happy about this. They didn’t like the fact that Jesus would spend time with “sinners,” those people who didn’t follow the rules or who cheated or lied or stole. They grumbled and complained about the company that Jesus kept. When Jesus heard this grumbling, he told them two stories or parables so that they would understand and change. Parables are special stories that help us understand something important about God. Listen closely to this parable and see if you find the important thing Jesus wants us to know about God. This story is not included in The Picture Bible. Have the children turn to page 600 where it discusses parables. Review this information with the children. Then use the handout attached from The Children’s Bible in 365 Stories to tell the story. NIV Adventure Bible: Luke 15:1-10, Matthew 18:10-14. Where in the Bible would we find a story about Jesus? (New Testament) This parable is found in two gospels: Matthew and Luke. Did you discover the important thing about God, the main reason Jesus told this parable? How many of you have stuffed animals in your room or on your bed? What about things on your dresser or in your notebook at school? Do you have things arranged in such a way that if something were missing, it would not be the same? Would you search and search until you found it and everything was the way it “should” be? When it is apparent that MOST children know the basics of the story, please use this supplemental idea to explore the story in more depth. Copy the images onto cardstock and cut out into cards. Show the cards in the order they would appear in the story. Have the children explain how the card fits in the story. Add details (from Background Information) as you discuss each story card. In later weeks (or for older children), shuffle the cards and have children first sequence the cards as they tell the story in their own words. How might it feel to be lost? When is a time you have felt especially lost or separated from God? What are ways we get lost? Do we just not pay attention and wander away? Do we take our eyes off Jesus for a moment or two and find ourselves lost? Do we intentionally sneak away? Can we ever really be lost from God? Do you think the religious leaders rejoiced at this story? Why or why not? The Bible tells us many names for God and for Jesus. One of them is Shepherd. How is God like a shepherd? For older children: This is a story about God’s grace….grace is God’s free gift of mercy and love. God loves us so much that he will always come after us if we wander away or get lost. John Wesley (founder of Methodism) described this kind of grace as prevenient grace. This grace means before we even know about God, God is loving us and coming after us, calling us to Him. Grace is a FREE gift. It can’t be earned. There is nothing we can do to deserve it – God gives it to us for free. Did the religious leaders who weren’t happy understand this about grace? (No… they believed they could be “good enough” to earn God’s love by following all the rules. Now rules are a good thing. But rules won’t save us. Only God’s grace will save us. Each rotation we encourage the children to memorize the Rotation Memory Verse. Review it with the children at this time. 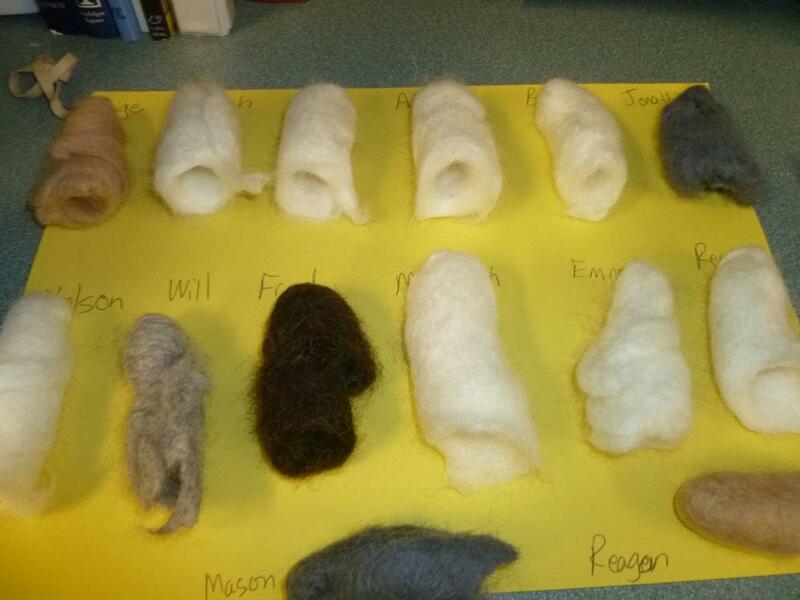 Children will make wet felted sheep finger puppets to be used in the drama session. Puppets will stay at church until the end of the rotation and then children may take them home. Prepare a sample felted finger puppet to show to children and to familiarize yourself with the process. Cover all tables with old tablecloths. Set out the tubs of hot, soapy water on the tables, with a towel underneath. Set the tubs of cold water with extra towels in another area of the classroom. Show the wool roving to the children and the completed finger puppet prepared earlier. Explain that wool has little “barbs” “scales” on the fiber– you can’t see them with your eye, but if we looked with a microscope we would see little sharp ends sticking out. When you push these barbs together they stick. Hot water and soap help and squeezing the roving pushes the fibers together and makes it firm – it turns the wool roving into fabric called felt – show the piece of craft felt. You can mold the fiber into all sorts of shapes. Show them how to gently pull apart the fibers – don’t cut – grasp both ends about 6-8 inches apart and gently pull until the fibers separate. You want a section about 12 inches long. Demonstrate how to wrap the roving around your index finger. Wrap vertically (going over the end of your finger) and then wrap around and around. Repeat until there are no holes and the roving feels to be about 1/8 inch thick and you can no longer feel your knuckle. It should look like a big fluffy bandage around your finger! Show children how to dip the roving-covered finger into the warm soapy water until it is thoroughly soaked. Remove from the water and squeeze and press and roll the wool with your other hand. 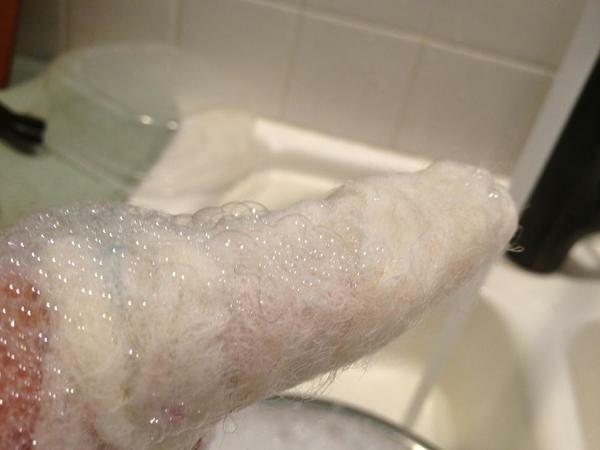 Add a small squirt of extra soap if needed to help the fibers join together. 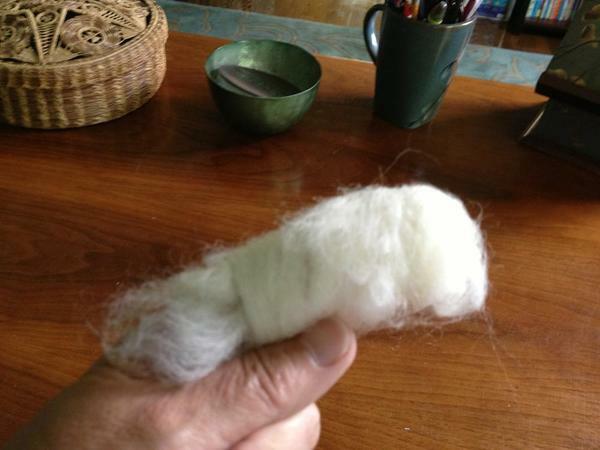 Continue to re-wet the finger and squeeze and lather the wool until it begins to feel solid. This should take about 5-7 minutes of continuous wetting, squeezing and rubbing. Be sure to push on the fingertip too. Rub it into the palm of your other hand to felt the finger tip. You’ll know it’s done when the fibers are no longer loose and it feels like a semi-snug casing around your finger. Gently pull finger out of the felted casing. Rub the inside of the casing to felt it as well. Add extra soap if needed. Smooth out the bottom of the finger puppet by rubbing and squeezing. Next dip your wooly finger into the cold, clear water to stop the felting process. Squeeze your finger to remove the excess water. Wrap finger in a towel and squeeze to help remove more water. Set aside to dry on drying racks. Allow the puppets to dry for a few minutes. Small snips of black felt can be sewn to the head for ears. (if sewing is too difficult for the younger children, they can glue the ears on once the puppets have dried a bit. The last ten minutes should be reserved for journal time. This is an opportunity for processing and reflection about what the children have learned. Ask the shepherds to pass out the journals and pens/pencils. Place the journal question sticker for the day in each journal. 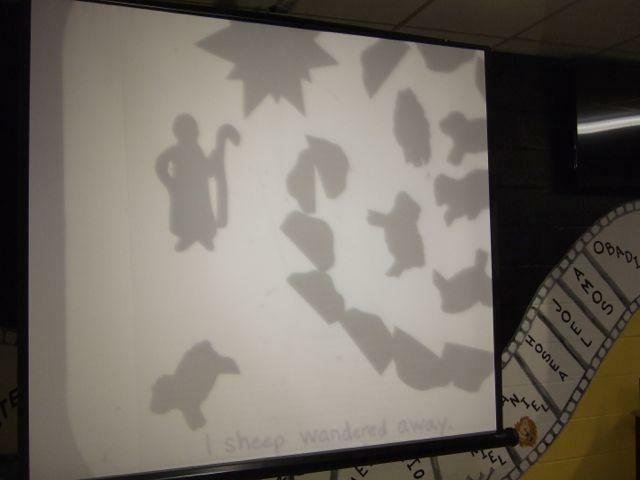 Grades K-2: Draw a picture of the Good Shepherd finding the sheep. 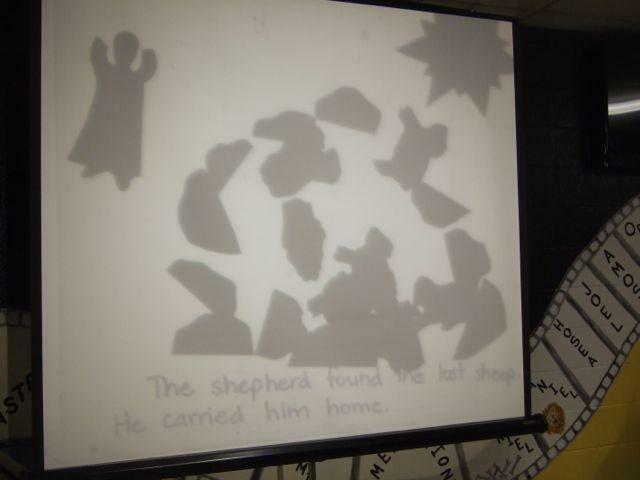 Grades 3-5: How is Jesus like the Good Shepherd in this story? Encourage the children to come back next week for another workshop, and to invite their friends. Remind the children of one word or concept from today’s session. Shepherd, sheep, grace, love, rejoice, mercy, parable are some possibilities. Ask for prayer requests and pray together, ending with the Lord’s Prayer. Help Shepherd collect Journals and nametags and put away. Gather all the props and costumes and put them away in the prop and costume closet. The Children’s Bible in 365 Stories by Mary Batchelor, Lion Publishing, 1995; The Parables of Jesus by Tomie DePaola, Holiday House, 1987. Children will review the story by playing a life-sized board game. Read the Background Information, teaching tips and lesson plan. Play the Rotation Music CD as children arrive and during journaling. The purpose of the Bible Quest workshop is two-fold: to develop Bible skills and to reinforce that knowledge by having fun with games. The games are not frills and fluff! Playing games helps to cement the knowledge and reinforce the skills you introduce during the Bible lesson. Children learn best when actively involved, so please do not skimp on the games portion of the lesson! Follow the time guidelines to help you stay on track. Remember – children will study this story for 4 weeks, so if you can’t cover all the details of the Bible story it’s ok. Locate and copy images (2 copies of each image) as above and cut to fit on an index card. Make a duplicate set of cards. Hide the cards around the classroom before children arrive. As children arrive tell them that you have lost some cards in the classroom. Have them search the room for the index cards with the images. Once found, have them find the match to each card. Scripture: Luke 15:1-10, Matthew 18:10-14,“The Story of the Lost Sheep,” The Children’s Bible in 365 Stories. Jesus is sometimes called the Master Teacher. He taught by telling stories that helped people understand more about God and God’s Kingdom. He used everyday objects to tell the stories. Do you know what these special stories were called? (Parables) Shepherds and sheep were very common in Bible times. We don’t see many shepherds any more. If Jesus were teaching us today, I wonder what he might use as examples to help us understand more about God…. Gospel means good news. The gospels tell the good news of Jesus’ life, death and resurrection. Let’s find the story in our Bibles now. Before reading/telling the story, review the words with the children. Tell them to listen carefully to the story and when they hear one of the “key words” to raise their hands. As you read the story, pause to discuss the meaning of these key words. Use the Background Information to discuss in more depth. How should we react when someone who is “lost” is found? How do we rejoice with the Good Shepherd? Children will play a life-sized board game, answering questions about the story as they gather up sheep and finally locate the lost sheep. Unroll the game board onto the large open area of the classroom. Set the stuffed sheep at the finish line. Have children remove their shoes before walking on the game board. Divide children into two or more teams of 3-4 players. One player from the first team rolls the die. Teams should roll the die on the ground, rather than throw it in the air! The team advances the number indicated on the die. Teams must move together on the game board. If teams land on a designated space (cross, dynamite or question), they must respond to a corresponding question. Cross question lists are life application situations with positive results, dynamite lists are life application situations with negative results and question lists pose questions about the day’s story. IMPORTANT: Teams should confer together before responding. Individuals who shout out answers without conferring with their team will lose a turn. This is important – conferring together helps infrequent attendees and visitors feel a part of the game. This also prevents overly assertive children from monopolizing the game. If a team answers correctly or lands on a Cross space they are awarded with 1 sheep token for each member of their team. No sheep tokens are awarded for Dynamite spaces. Cross and Dynamite spaces may require teams to move forward or back according to card directions.Once they have moved, play passes to the next team. The first team to cross the finish line will find the lost sheep! Have team members count the number of sheep tokens they have accumulated. Team with the most sheep wins! Please pause and discuss the situations described on the cards. The Cross and Dynamite cards are designed to promote lively discussion within the teams. Kids often know the “right” answers that we expect. Encouraging them to explore more deeply and confront their own attitudes is more difficult. This is how life transformation occurs, however, and we need to try to get them to think beyond the simple, “pat” answer. If the questions seem too difficult for this age level, modify them into “True-False” statements. If the question requires looking up a specific scripture reference, you or the shepherd can look it up and read it to the children from the NIV Adventure Bible. Have the children listen as you read the scripture, then have them answer the question or perform the action. What are ways we can get lost or separated from God? You have a friend who has never been to church and doesn’t know anything about Jesus. You invite him to come with you to Sunday school. Move ahead 2 spaces. You memorized your Rotation Memory Verse and taught it to your neighbors. Move ahead 1 space. Go as a team to the mural on the wall and point to the sheep that are painted there. You have been too busy to read your Bible lately, and realize that it’s been several weeks since you prayed. You pray to God asking him to forgive you and to help you get close to God again. Move ahead 3 spaces. You decide to ask a friend to come with you to church each Sunday and Wednesday. You especially want to invite friends who don’t already go to church. Move ahead 2 spaces. You understand that you have done wrong things and you are sorry. You believe that Jesus died so you could be forgiven. Move ahead 3 spaces. Jesus told a parable about a shepherd who had 100 sheep. Go to the white board and quickly draw 100 sheep. Move ahead 1 space. The shepherd herded his sheep into a safe sheepfold at night to protect them from wild animals and to keep them together. Go as a team to a corner of the room. Baa like sheep ten times! Move ahead 1 space. Sheep followed their shepherd because they loved and trusted him and they knew his voice. Have one person from your team be the shepherd and lead your team of “sheep” all around the room. Move ahead 2 spaces. Each person on your team, tell a way that you know God loves you. Move ahead 3 spaces. Each person on your team, tell a way that you can show God you love and trust him. Move ahead 3 spaces. Go to the white board and write out the Memory verse for this Rotation. Don’t forget the scripture reference. Then stand together and recite it together out loud. Move ahead 2 spaces. You’ve been feeling far away from God lately. You talk with your mom and dad about it and pray together. Move ahead 3 spaces. Your family prays together every day before meals and at bedtime. Move ahead spaces. You help your little brother say his prayers. Move ahead 2 spaces. You used to come to Sunday school and Wednesday night church all the time, but you have gotten so busy you don’t come anymore. Move back 2 spaces. You tell your parents you don’t want to come to Sunday school because your friends don’t come and you don’t want to meet new people. Move back 2 spaces. You forget your Bible at home. Move back 1 space. You thought about asking the new kids at school to come to church, but you’re afraid your friends won’t like them, so you don’t. Move back 3 spaces. Your friends at school say they believe in Jesus, but they say mean things about people behind their backs. You join in with them so they will like you. Move back 3 spaces. You got into a fight with someone at school and really hurt them. You’re sure God could never forgive you for doing such a mean thing, so you decide not to come back to church. Move back 2 spaces. Your friends at school form a club that only invites kids who belong to the Country Club. You join them. Move back 2 spaces. Your mom spends a weekend with your cousin who got into trouble at school. ou get mad because she can’t take you to the pool with your friends. Move back 2 spaces. A girl at school who is always in trouble says that she has become a Christian. Your teacher lets her go on the special field trip. You are mad and say it’s not fair because she doesn’t deserve to go. Move back 2 spaces. You are too tired to pray before bed. Move back 2 spaces. A boy at school asks if he can come to church with you sometime. You say no because you are afraid he won’t fit in with your other church friends. Move back 3 spaces. You never talk about Jesus to any of the kids at school because so many of them are so mean, they don’t deserve to know about Jesus’ love. Move back 3 spaces. You decide to go to a pool party instead of coming to Sunday school. Move back 2 spaces. You get back late from vacation on Saturday and sleep in on Sunday morning. Move back 2 spaces. You tell the new girl in your class that you will come to her party. Later you find out your friends are going to a different party. You call and tell the new girl that you can’t come because you are sick. Move back 3 spaces. Download the music video to a laptop or burn to a DVD and show on a TV. Older children will watch the video and then write in journals. Play the video as the children watch and listen. The last ten minutes should be reserved for journal time. This is anopportunity for processing and reflection about what the children have learned. Ask the shepherds to pass out the journals and pens/pencils. Place the journal question sticker for the day in each journal. 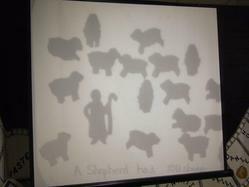 Grades K-2: Draw a picture of the shepherd with his sheep. 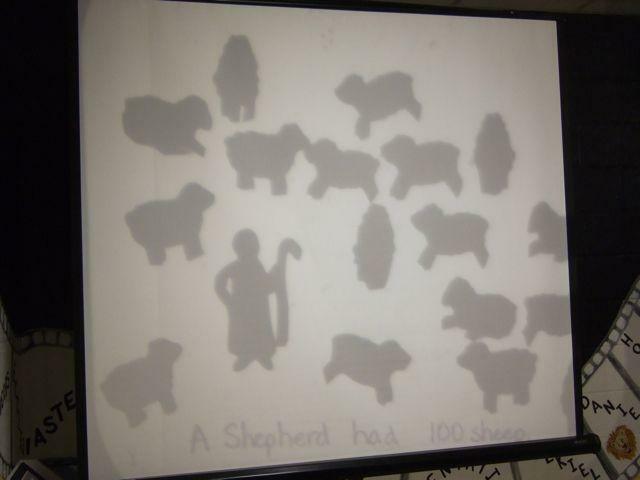 Grades 3-5: How did the sheep know that the shepherd loved them? How do we know that God loves us? Gather the childrentogether. Review with them one word or concept that they learned in today’s session. (Love, grace, lost, mercy, rejoice are some suggestions). Encourage the children to come back next week for another workshop, and to invite a friend, especially friends who do not belong to a church. Remind them to bring their Bibles. Ask for prayer requests and pray together, ending with the Lord’s Prayer. Have the children help clean up the room. Roll the game board back up on the carpet roll and store at the edge of the wall. Replace the stuffed sheep and game die in the cabinet. Children will illustrate and retell scenes from the story using Kid Pix software. Preview the software prior to class. (Feel free to take a CD home or come to the computer lab before class to preview it). Turn computers on prior to class arrival and insert CDs. Double click on the desktop “Kid Pix” icon to open the program to the opening screen. Make sure speakers are plugged in (light green port on back of computer tower). Make copies of the Kid Pix Navigation Tips– one per station + copies for shepherds and helpers. Cut apart the character list. 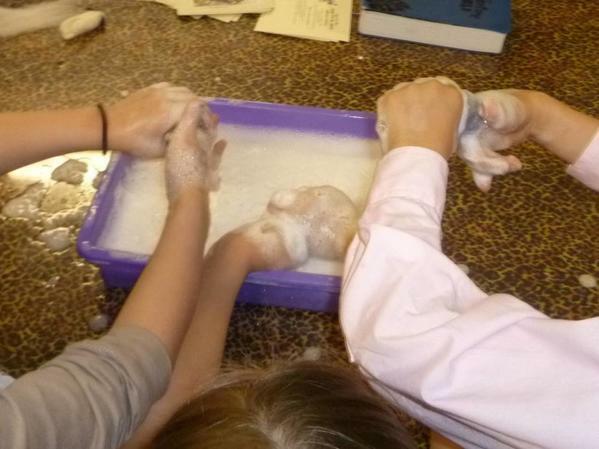 This workshop can always use extra hands, especially when working with the younger children. Ask the shepherds to sit with the children at a computer station and help with navigation, reading text and discussion. You might also want to pair older students with younger ones. As much as possible, try to sit with your students as you go through the software together. The lesson is not what’s on the computer. It’s what you and the students do with what’s on the computer. Guide your students through the content, share openly and facilitate their sharing with each other. Model your enthusiasm for the Word of God. Welcome the children and introduce yourself. Begin each class with introductions. Remember that workshop leaders rotate often and the children may not know you. One of our primary goals is to improve the children’s Bible literacy! If children do not bring their Bibles from home, use the classroom Bibles. Shepherds should help the children locate the stories. Use the handout “Helping Children Learn to Use their Bibles” and the background information to help you introduce the story. Remember, that as the rotation progresses, the children will become more familiar with the story. When this happens, allow the children to tell you what they know. The children should still locate the story in their Bibles every week. Use the bold headings in their Bibles to guide your discussion. You may want to review some of the Bible notes as well. Be sure to fill in any missing information and add additional details using the Background Information to help you. One of the greatest advantages of this model is that children who come regularly learn the story in great depth. Each lesson contains more Background Information and discussion questions than can be used in one session. Remember, children are studying this story for four weeks! Be sure to follow the time guidelines and leave ample time for the activities. Scripture: Luke 15:1-10, Matthew 18:10-14, “The Story of the Lost Sheep” page 334-335 Little Kids’ Adventure Bible. Let the children help you look for a few minutes…. then stop. Ask: Have you ever lost something? How does it make you feel? Was it important? Our story today is about something lost also and about the person who searched for it and found it. Let’s read about it now. Jesus is sometimes called the Master Teacher. He taught by telling stories that helped people understand more about God and God’s Kingdom. Often Jesus taught using special stories called parables. A parable is a story that teaches us something important about God or God’s Kingdom. I wonder why the sheep got lost…. What was it doing? I wonder how the sheep felt when it realized it was lost? I wonder how the other 99 sheep felt when the shepherd left them to look for the one who was lost? “Be joyful with me. I have found my lost sheep.” Luke 15:6b. Cut apart the character slips, one per computer station. Divide the children into pairs at each computer station. Give each computer station a character slip with an assigned character and suggested questions. Children should FIRST write several sentences or a short paragraph answering the questions using the text feature of Kid Pix. After writing, they may illustrate their writing. Make sure they take turns with the mouse. Print the completed stories/illustrations and give to children to take home. Please print an extra copy for our scrapbook. Why do you think the sheep got lost? What might the sheep have been doing? How did the sheep feel? What might have happened to the sheep if he hadn’t been found? How did the shepherd notice the one sheep was gone? How did the shepherd feel? What do you think he might be thinking? How did the other 99 feel when the shepherd left? What did they think about the lost sheep? Were they worried, mad, jealous? What do you think he said to the lost sheep? What were they thinking and feeling? Do you think they enjoyed the party? After children have completed their stories/illustrations, take the group around to each computer station to read and discuss what they have written. Gather children together in a circle. Review with them one word or concept from today’s lesson (suggestions include: parable, lost, found, rejoice). Ask for prayer requests and pray together, ending with the Lord's Prayer. Clean-up: Help Shepherd collect nametags and put away. Gather all paper and pencils and place on the front table. Remove CDs from the computers, placing in their storage cases and shut the computers down. Children will act out the story using felted finger puppets created in the art workshop. You may wish to organize costumes or puppets ahead of time to cut down on a flurry of activity and possible hurt feelings. Have props ready ahead of time. This is especially important for the younger children. The older children often are very creative with props and costumes. Be sure that all children are involved in some way. Some children are intimidated by the prospect of being on a stage. Offer them alternative roles as well as the children who do not have main parts. They can always be “sound effects” or “crowds” or stagehands to help change scenery, or video camera operators (for the older children). Remember as well that children can draw the backdrop for the drama on the blackboard or videotape the plays (older children). To eliminate competition, you may wish to place the names of characters in a hat and have children choose their parts. Be sure to explain the activity to the children and ask for questions to be sure you are clear. Even though videotaping the activities may seem unnecessary, videotaping seems to encourage better behavior from the children. Have fun and make this fun for the children! Read the Background Information, teaching tips and lesson materials. Be sure to review the information about using puppets. Plan to review this with the children. Gather necessary props. 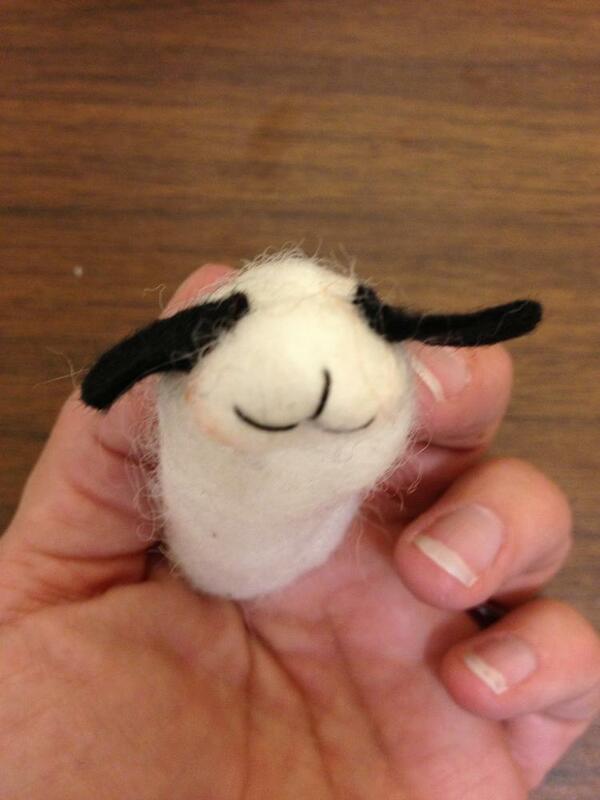 Children will use the sheep finger puppets created in the art workshop. Preview the Rotation Music CD. Play the music as children arrive and during journaling. Have children draw on the blackboard: high rocky mountains and beneath them a pond and a sheep pen with a fence, lots of sheep inside the fence, one sheep somewhere away from the rest of the sheep. Gather the children near the stage and blackboard with the drawings. Welcome the children and introduce yourself. Make sure you are wearing your name tag and that the children have picked up their nametags. Always begin each class with introductions. Please open class with prayer each week. You may pray your own prayer or use the prayer below: Dear God, We praise you and we thank you for all our many blessings. Be with us today as we learn more about you. In Jesus’ name, AMEN. Jesus was a master storyteller. People flocked to see him and to listen to his amazing stories. Many of Jesus’ stories were called parables. What’s a parable? (a special story that has two meanings – it tells just a basic story and also explains something about God or God’s kingdom.) Jesus used everyday examples to help the people understand things about God. Sheep were very common in Jesus’ time. Today’s parable is about a sheep who became lost. Today’s story is found in the gospels of Luke and Matthew. What does gospel mean? (good news) The gospels are the first four books of the New Testament. Let’s find the story in our Bibles now. I wonder how the lost sheep felt…. I wonder how the 99 sheep that didn’t get lost felt when the shepherd left them…. Were you surprised by that response? I wonder why the shepherd didn’t get mad at the sheep for wandering away? Have children seated at the stage, facing the blackboard with the early arrival drawings. Have children open their Bibles to Luke 15:1. Ask them to tell you what they know about the story. Encourage them to describe the story in the correct sequence. They can look at their Bibles if necessary. Repeat until the story is completely told and illustrated on the blackboard. Use the Reflection questions to discuss the scenes. How are we sometimes like the sheep that got lost? How are we sometimes like the sheep that stayed where they were supposed to? Which type of people does God love most? Who was Jesus speaking to when he told this parable? Why do you think Jesus told this parable? What are ways we can go and look for people who are lost from God? Gather the children together near the puppet stage. Explain to the children that puppets are not toys – they are characters. Puppets should always be treated with care and respect. If there are enough puppets, pass one out to each child to practice puppet skills. (if you don’t have enough puppets, children can use “invisible puppets” using their hands as the puppets. Demonstrate to the children how to move the puppets. Have the children make their puppets jump, walk, nod their heads, shake their heads, act happy, act sad, act afraid, act angry, fall asleep, etc. 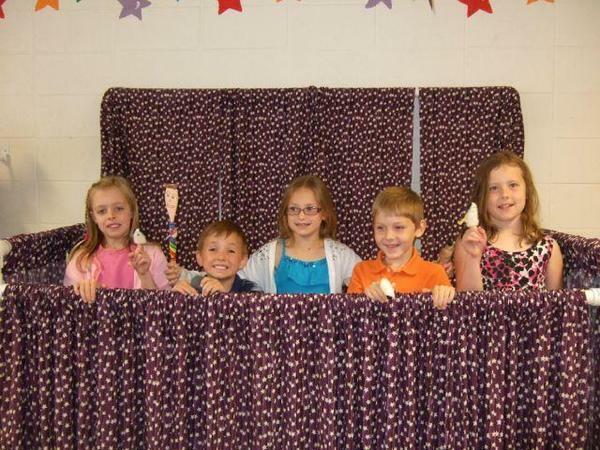 After everyone is confident with their puppet actors, assign parts for the skit. Teacher or narrator should read the script and pause at the specified parts in the dialogue to allow the children to act out the story with the puppets. Encourage the children to add dialogue and to improvise. The skit is very short and can easily be repeated allowing children to rotate roles. Encourage the children to change the dialogue as the skit is repeated, putting it into their own words. If you have a very large class, divide the class in half and perform the skit two times – with half of the group serving as the audience (Pharisees and crowd) and half working with the puppets. Have a child volunteer read the narrator’s part. See script at end of this lesson. The last ten minutes should be reserved for journal time. This is an opportunity for processing and reflection about what the children have learned. Grades K-2: Draw a picture of the lost sheep. How was he feeling? Grades 3-5: How can we get lost like the sheep? In what ways do we wander away from God? Gather the children together. Review with them one word or concept that they learned in today’s session. (God’s love, lost, forgiveness, mercy, grace are some suggestions). Encourage the children to come back next week for another workshop, and to invite a friend, especially friends who do not belong to a church. Remind them to bring their Bibles. Ask for prayer requests and pray together, closing with the Lord’s Prayer. Have the children put away all props and costumes. Keep the felted sheep finger puppets until the end of the rotation. They will be sent home with the children after the last session. Please encourage them to help us keep our room neat and orderly. Many years ago, Jesus was teaching the people. Jesus often used special stories called parables to help the people understand the point of the story. On this day there were lots of Pharisees and teachers around. They were whispering and murmuring about Jesus’ teaching. They couldn’t understand why Jesus was acting so friendly to tax collectors and other sinners! Didn’t he know these people were unclean! They were BAAAAAA-d people! Jesus heard what they were saying. He knew that they didn’t like his message. So he told this special story, a parable, to them. There once was a shepherd who had 100 sheep. Now the shepherd loved his sheep. He took good care of them. He led them around to find nice, fresh green grass to eat and cool, clear water to drink. The sheep knew the shepherd loved them. They loved the shepherd too. They knew the shepherd’s voice and followed him everywhere. (Sheep rub up against the shepherd, Shepherd pats their heads and leads the sheep around some more). Now sheep aren’t very smart animals – sweet, but not very bright. They are also very easily frightened. Wild animals scare them. Fast moving water scares them. Birds scare them. Loud noises scare them. They get scared pretty easily, actually! That’s why the shepherd always stayed close by and takes them to nice, still water. And every night the shepherd would bring the sheep into the sheepfold – a protected spot that was surrounded by rocks or wood. The walls kept the sheep from wandering off and getting lost. “OH, NO!!! Only 99! I had 100 sheep. Where is my last sheep? Maybe I should count again and make sure. 1, 2, 3….. 97, 98, 99…” Still only 99! Where is my other sheep? What should I do? I still have these 99 sheep here…. Only one is missing…. What should I do? I wonder how the sheep got lost…. What do you think? Well, I LOVE all my sheep, even this one who has wandered away. I’m not sure why he isn’t here. I’m not sure why he didn’t follow me like he knows he should. I’m not sure what happened, but I know I love him and I have to go and find him. These 99 sheep are safe here in the sheepfold. I’ll be back after I go and look for the lost sheep. There you are! My precious little lamb! Don’t be scared anymore. Your shepherd is here! I love you and I’m so happy to find you safe and sound! Come with me you sweet little sheep! Let’s go home! And the shepherd picked up the lost little lamb, placing him gently on his shoulders and carried him back to the sheepfold. Children will watch several short video clips portraying the parable of the lost sheep. 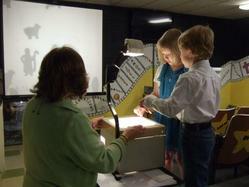 They will recreate the story using an overhead projector and foam and cardstock shapes. Read the background information and lesson plan. Prepare the popcorn before the children arrive and have it bagged and ready to distribute so your attention can be given to the children. 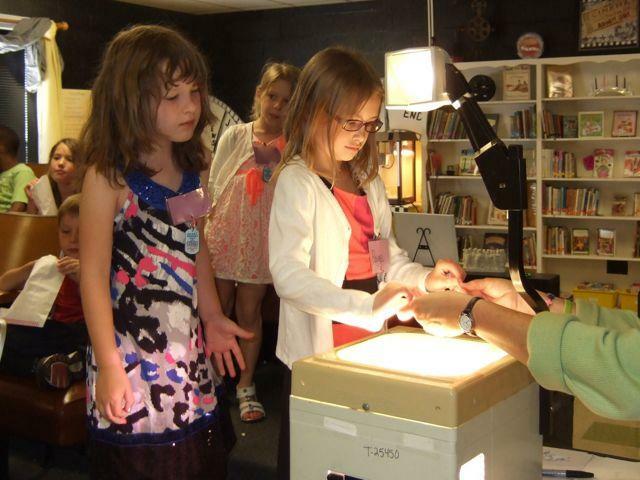 Gather Overhead Projector storytelling supplies – see list below. Children love this workshop! Often the video is a direct correlation with the Bible story and creates a concrete, visual image in the children’s minds. They refer to this image over and over throughout the rotation as they visit other workshops. Some videos may take some liberties with the story-you may need to point out these discrepancies. As much as possible sit down with the children and watch the video together. Feel free to pause the video to discuss something that you especially want them to note. Please ensure that the children treat the room with respect-no standing, jumping, or otherwise abusing the seats. Please start on time and follow time guidelines! Copy the handout onto labels and affix to index cards or cardstock. Separate the cards into two stacks – one for the word and one for the definition/explanation. As children arrive, encourage them to work together to match the word cards with the correct meaning cards. Please open each session with a prayer. Loving and merciful God, Thank you for this day and for our time together. Give us open hearts and minds as we learn more about you from this story. Amen. This month we begin a series of studies about Jesus’ parables. What is a parable? (a story that uses everyday images to explain something about God or God’s kingdom). Jesus told parables to answer questions or to explain things to his followers. Jesus used everyday objects and common situations in the parables he told. This helped the listeners better understand what Jesus was trying to show them. The images that Jesus used were very familiar to the people who lived then, but they may not be so familiar to us today. We are not out herding sheep very often these days. So, what images might Jesus use today to convey the same truths? Parables require us to think deeply about the story and its meaning. Parables help us understand the message on different levels depending on where we are on our faith journeys. Jesus often said that the unwilling and those without faith would not understand the deeper meanings of the parables told. To these people, a parable was simply a story. But for those who listened with willing, open hearts and faith, the message could be life transforming! This is true for us today as well! Have children season their popcorn according to taste BEFORE the movie starts. Hand out popcorn and a drink. Have the children move to the theatre seats. Once the movie begins, children should remain in their seats until it is finished. Getting up and down out of seats is distracting to everyone! As you know this is a very short story in the Bible. So we are going to watch a few different video clips that portray the story in different ways. 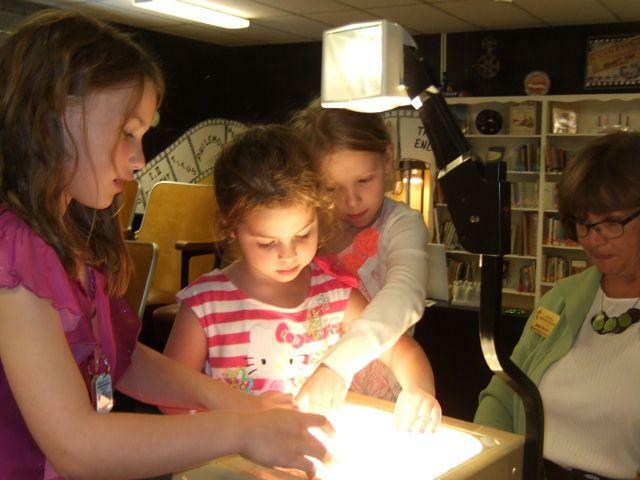 Then we will recreate the story ourselves using an overhead projector and some story shapes. Pay attention to where in the story these emotions or ideas were expressed and by whom. Write the key ideas on a flip chart and place in the front of the room. After the video clips are finished, discuss what they noticed. Who felt fear, loneliness or danger? (sheep, shepherd, maybe other sheep) When? What did the lost sheep feel and experience? In the Bible God and Jesus are often referred to as the Good Shepherd. Why do you think that might be a name for them? In the Bible WE are often referred to as sheep. How might we be like the sheep in this story? We said that a parable has deeper meanings. This is a story about a shepherd and his 100 sheep, but it’s more than that. It’s a story about how much God loves us and how far God will go to find us when we are lost. What does it mean to “go after” someone who is lost? How might we do that in our lives? How might YOU do that? What we learned note: This was a really novel and effective way to retell the story. It would be a GREAT way to review the Bible story in later weeks of the rotation. We kept the kids who weren't actually creating the scenes engaged by asking them to think of ideas... and then letting them make suggestions to the kids who were making the scenes. Our original idea: to take photos of the older kids' scenes didn't work -- we forgot the camera and it was the first week of the rotation so they ran out of time. Still like the idea though! Cut out a simple shepherd silhouette. Set the foamie shapes/letters into paper plates. Set up the screen and overhead projector in the classroom. 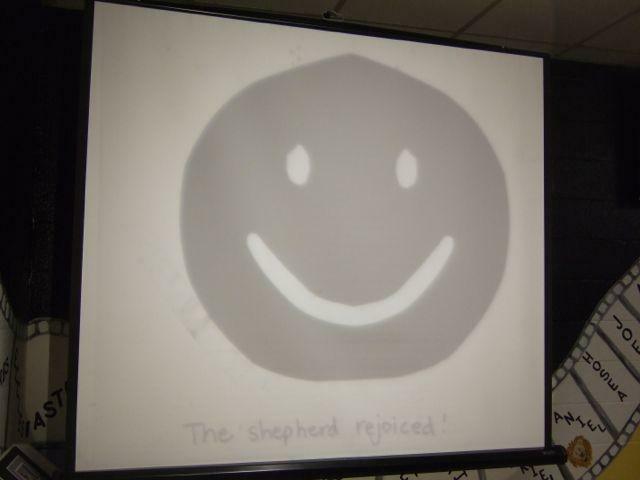 Say: We’re going to work together to retell the story using transparencies, shapes and the overhead projector. We will take pictures of your scenes and use these to teach the younger kids the story. The title of the story – a creative name? Include parable. Once there was a good shepherd who had 100 sheep. He loved and cared for the sheep very much. One evening while putting the sheep into their pen he noticed that one sheep was missing. The shepherd left the 99 sheep and went to look for the lost sheep. He looked and looked and looked for the lost sheep. When he found the lost sheep he picked him up and carried him on his shoulders back to the other sheep. He was very glad to find his lost sheep and invited all his friends to celebrate with him. Divide children into pairs and assign a scene to each group. Give children about 5 minutes to plan their scene and choose their shapes. 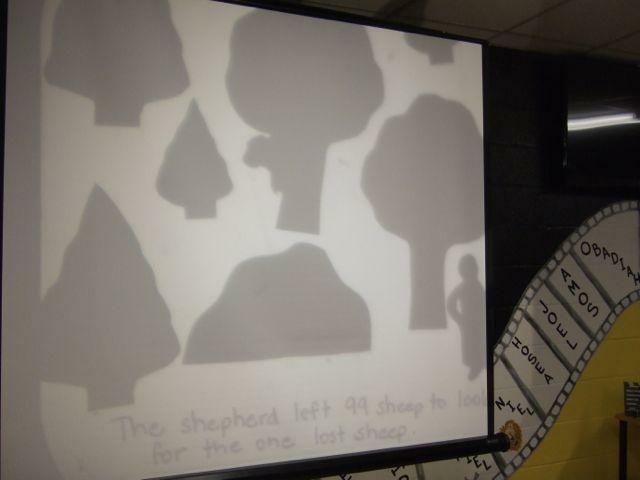 Have the children come up to the overhead projector two at a time to create the scene using the cardstock/foamie shapes. Have the children write a simple explanation of the scene using the transparency markers. Other children should be watching as the scene is created. Move quickly… each scene should take just 1 minute or so to create. Encourage children to be creative and add “rocks,” “grass” and other shapes cut from the cardstock. Discuss each scene. What is happening? What are the characters feeling? How can that be shown on the screen? Photograph each scene as it is shown on the screen. Write out the scene titles onto strips of paper and assign these to pairs of children. Write the titles onto the transparency sheets before the children assemble their scenes. Show the pictures from the 3-5 grade class to the K-2 group. If this workshop is offered late in the month, allow the children to sequence the story as part of the activity. The last five minutes should be reserved for journal time. This is an opportunity for processing and reflection about what the children have learned. Grades K-2: Draw your favorite part of the story. Grades 3-5: What did you learn about God from this story? Gather the children together. Review with them one word or concept that they learned in today’s session. (Love, acceptance, parable, lost and found). Ask for prayer requests and pray together, ending with the Lord's Prayer. Have the children throw away their popcorn bags and cups. Clean out popcorn machine and sweep up any stray kernels. Put away Bibles, paper, pencils, videos, etc. Bag up trash and place outside the classroom door. Replace trashcan liner (extras are found on the shelf below the popcorn maker).